Nestled on an unbeatable location with marvellous views of Atlantic Ocean and Mount Teide, the Sunlight Bahia Principe San Felipe is a delightful landscape in Puerto de Santa Cruz. Jam packed with sport and leisure facilities and next to a sandy cove beach, this 4-Star vacation hotel is surrounded by beautiful gardens and offers a relaxed atmosphere along with 261 comfortable rooms and junior suites with modern amenities. 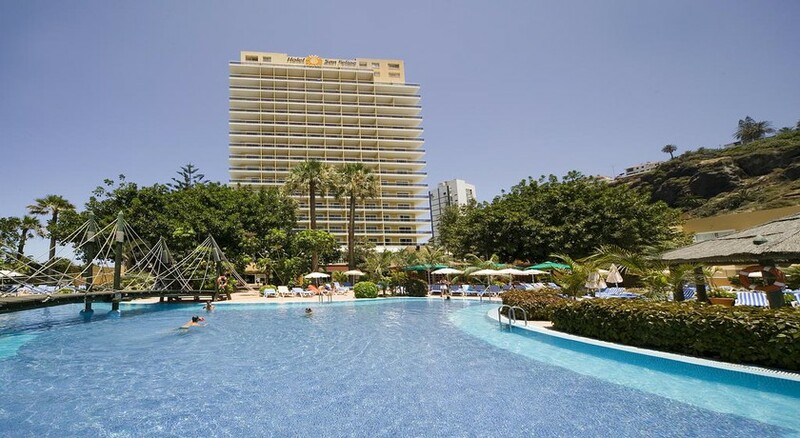 Guests to the Sunlight Bahía Príncipe San Felipe can relax on marvellous beaches and explore countless attractions such as Aqualand in Las Americas, Tenerife's Zoo and Jungle Park. Those who want to relax within the hotel’s premises can take advantage of the outdoor swimming pool and the pleasurable spa. All the four restaurants in the hotel serve food in a cosy environment, where you will find everything to eat that pleases you and yours. There are two bars in the hotel that will allow you to walk with your beverage to the pool and the glitzy gardens. 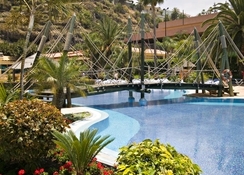 It is quite easy to reach the hotel’s location, as the Tenerife North Airport is only 26.3km. It will be an exciting stay for the ones who like to explore the sea, sand and mountains. Mount Teide, which is a famous volcanic mountain is about 40km from the hotel. There are several shopping malls close to the hotel. 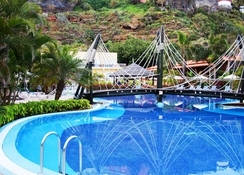 All the rooms at the Sunlight Bahia Principe San Felipe adorn Spanish elegance. 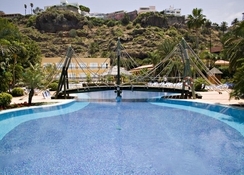 The 261 rooms and suites are categorized as Standard, Standard Teide View, Standard Sea View and Junior Suite. All rooms have the necessary amenities including flat screen TV, air conditioning, two single beds or one king size, safe (with additional charge), mini bar with soft drinks, beer and water (with additional charge), iron & ironing board (upon request), hair dryer, bathroom amenities, bidet (upon request), bathtub with shower, wakeup service (upon request), Wi-Fi in the room (with additional charge) and handicapped rooms (available upon request). 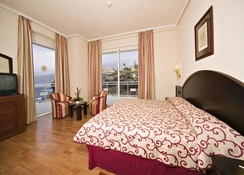 Most of the rooms come with a sea-view or Teide-view. The hotel conveniently houses four restaurants namely Teide Restaurant (International Cuisine Buffet), Pool Restaurant (International Cuisine), Portofino Italian Restaurant (Traditional Italian Cuisine) and Mediterraneo Restaurant (Fresh Mediterranean Food). The Teide Restaurant is where you indulge in conventional dishes prepared through a unique blend of spices from different countries across the globe. If you want to savour food and drinks sitting near the pool, then the Pool Restaurant is the place to be. At the Portfino Italian Restaurant, you get a true Italian feeling, as you taste crispy margarita pizza, rich seafood risotto and creamy pasta alfredo. Those who are very health conscious can head to the Mediterraneo Restaurant that serves light and healthy ingredients of Mediterranean cuisine alongside local dishes handcrafted by the chefs. Those who want to enjoy their holiday with unlimited drinks can hit the bars throughout the resort or the Pool Bar. This is a wonderful place for the ones who like to enjoy innumerable sports and entertainment facilities under a single roof. The sizzling spa in the hotel has everything in store for you from the exclusive Bahia massage to wide-ranging beauty treatments. What’s more exciting is that it offers a unique and unforgettable experience to special couples with a private Jacuzzi and the massage’s cabin comprising scents, candles and flowers. Refresh yourself with a relaxing swim in the pool or relax yourself on the water beds or the sun loungers dotted across the pool. While you take part in a number of sports, you can let your kids have fun in the mini club or the Bahia Spouts that offers arts, face painting, crafts and water games. Apart from this, there are many beaches, lakes and of course the famous volcanic landscape Mount Teide for offering you ample entertainment. Me and my partner both visit various Bahia resorts around the world and this just seemed to fall way off the mark compared to the rest of the hotels in the brand. Good location, despite the weather.